Singapore may have traded in its rough-and-ready opium dens and pearl luggers for towers of concrete and glass, and its steamy rickshaw image for hi-tech wizardry, but you can still recapture the colonial era with a gin sling under the languorous ceiling fans at Raffles Hotel. It is this carefully stage-managed combination of Western modernity and treasured Eastern and colonial past that makes Singapore such an accessible slice of Asia. The Republic of Singapore is made up of the main island of Singapore and 60 other smaller islands. With a total area of 253 square miles (655 square kilometers), the main island resides a population of 3.87 million. 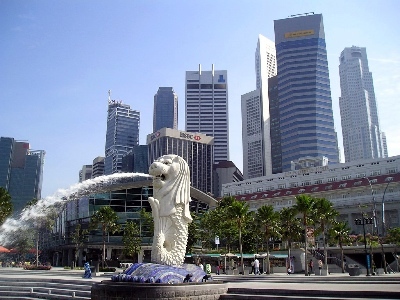 Singapore measures a maximum 26 miles (42 kilometers) from East to West and 14 miles (23 kilometers) from North to South. Lying close to the southern part of Malaysia, the two countries are linked by 2 causeways. The unit of currency is the Singapore dollar. Most shops and entertainment outlets accepted major credit cards and travelers checks. Use our Currency Converter to check the exchange rate that corresponds to your local currency. There is no need to tip if a 10% service charge is already added to the bill. If not, tipping is up to ones preferences.